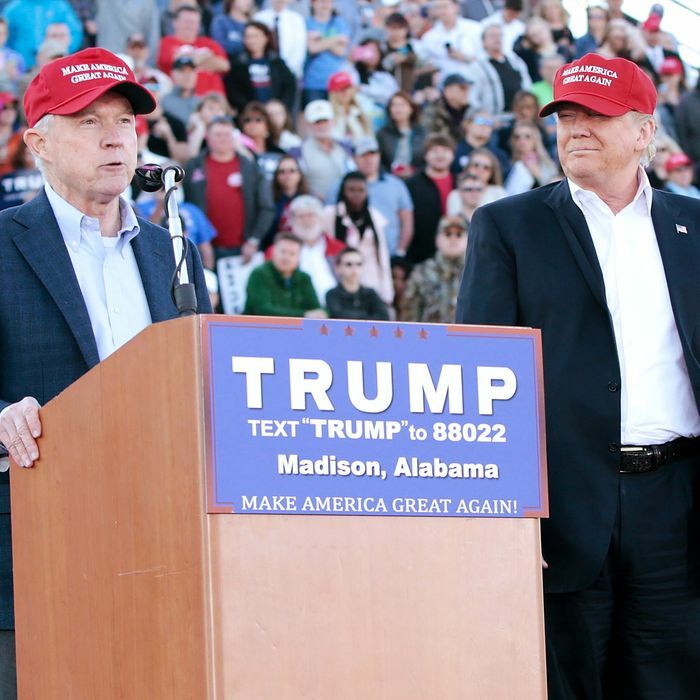 On Friday, Donald Trump selected Alabama senator Jeff Sessions for attorney general. Sessions was one of the first elected Republicans to endorse the mogul’s candidacy, inspired by Trump’s law-and-order stance — Sessions is one of the last champions of mandatory minimum sentencing for drug crimes — and the intensity of the GOP front-runner’s opposition to all things immigration reform. The senator became one of Trump’s closest advisers and most steadfast surrogates. Before Sessions was elected to the Senate in 1996, he was best known as the Alabama prosecutor so racist, a Republican-controlled Senate judiciary committee rejected his nomination to a federal judgeship (even though he was Ronald Reagan’s selection for that post). While Sessions may have been too racist for a judgeship in 1986, he is, apparently, just racist enough to be America’s top prosecutor in 2016. Still, the senator’s history is likely to become a focal point for Democrats and civil-rights groups during confirmation proceedings. Also on Friday, Trump chose Kansas congressperson Mike Pompeo as his pick for CIA director. Pompeo came to Congress via the 2010 tea-party wave, and serves on the House Permanent Select Committee on Intelligence. Pompeo is a graduate of West Point and Harvard Law School, and a close buddy of Vice-President-elect Mike Pence. On Thursday, Pompeo expressed his eagerness to rip up America’s nuclear agreement with Iran. The congressperson has, in the past, run afoul of American Muslim groups for suggesting that Muslims have failed to speak out against terrorist attacks.